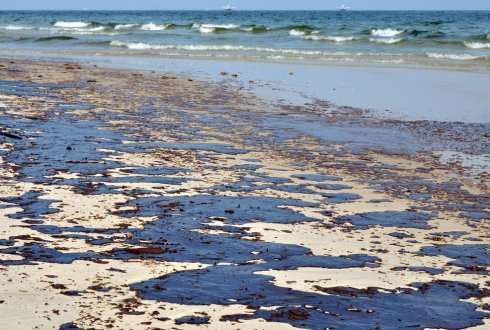 In an attempt to limit the harm of the Deepwater Horizon oil spill in the Gulf of Mexico in 2010, three million liters of dispersant were used to dissipate the oil. "The question is whether that was the best approach," said Tinka Murk, Professor of Environmental Toxicology at Wageningen University. On the surface the damage seems limited, but the seabed is covered with a thick layer of gunk. "There were no detailed contingency plans in place during the BP oil spill," said Murk. Therefore, ad hoc decisions were taken. Scientist from around the world are now working on models that can be consulted by decision takers when there is another oil spill disaster. "The Decision Support Tool should provide insight in what the effects are of different measures to get rid of the oil. Not only the visible effects, but also those below the surface," says Murk. The idea was that dispersants would dissolve the oil and that what was left would be strongly diluted in the sea water. This would cause very little environmental damage. But it appears that a lot of dirt has sunk in flakes to the bottom of the Gulf of Mexico, forming a thick layer gunk on the seafloor. Life on the seabed, and thus the entire ecosystem, is suffering severely from this pollution. So, although the visible damage of the disaster is relatively limited, considering that during a period of three months millions of gallons of oil flowed into the sea, out of sight, at 800 meters depth, a significant environmental disaster is occurring. With colleagues from Wageningen UR and the Northern College Leeuwarden, Murk examines the effects of dispersants on the oil and on the environment. This research is done within the international C-IMAGE consortium, the Center for Integrated Modeling and Analysis of the Gulf Ecosystem, which was founded to learn from the disaster with the Deepwater Horizon. This consortium comprises researchers from 13 universities and institutes, including Wageningen University and IMARES Wageningen UR. BP, owner of the Deepwater Horizon and thus responsible for the environmental disaster, finances the research. Recently, the Dutch C-IMAGE team, led by Tinka Murk, discovered that the dispersants are not as effective in real sea water (containing algae and other particles) as they are in clean water. "In sea water we see cobweb-like structures emerging," said Tinka Murk. The dirt sticks to the dead or living material in the water and these flakes then sink off to the bottom of the ocean. In filtered water, these cobweb structures don't appear. Wageningen University appointed three PhD candidates to study how oil droplets move through the water column (with and without the addition of dispersants, in clean water and real sea water), what happens during the dissipation process (under different circumstances) and how toxic the oil and dispersants are for marine life, in the water and on the seabed. For their research, the PhD students regularly receive sediment samples from the disaster-stricken area in the United States. Wageningen University has added a fourth PhD candidate to the project to examine the considerations that have to be made when an oil spill occurs. This part of the research is funded by Wageningen University's marine research programme TripleP@Sea. Information about the local conditions need to be gathered and the costs and benefits of various measures to act on the oil spill should be weighed; not only the costs of a cleaning operation, but also the impact on various ecosystem services such as the survival of important fish larvae, aquaculture, tourism and nature reserves. What would an oil spill mean for St. Eustatius? A case study is done for St. Eustatius, a small Caribbean island that is a special municipality of the Netherlands, since 2010. Murk: "Firstly, we will evaluate the threats are there. Oil drilling doesn't happen there, so that drastically reduces the changes of an oil-related disaster. But there is an oil storage company. Secondly, the weather and currents have to be taken into account, because these have a great influence on how the oil spreads. Thirdly, the ecosystem services present in the area have to be mapped: which organisms live there and how sensitive are these to oil and dispersants." With all this information a Decision Support Tool is developed. This tool should help to take a well-informed decision when there is an emergency. Naturally, this model will be developed in consultation with experts from Rijkswaterstaat, the national service that decides on the actions that should be taken after an oil spill, also in the Dutch Caribbean. Toxicologist Murk would also like to do a case study for the North Sea. However, at this moment there are no funds to do so. "The North Sea is very busy and complex. In this respect, we chose to start in a more manageable area: St. Eustatius."